How do I add the booking calendar to my website? Once you have set up your inventory, pricing, and reservation rules to your account. You're now ready to integrate the booking calendar into your website. This is a simple process that doesn't involve a technical background to achieve. We will discuss how below. 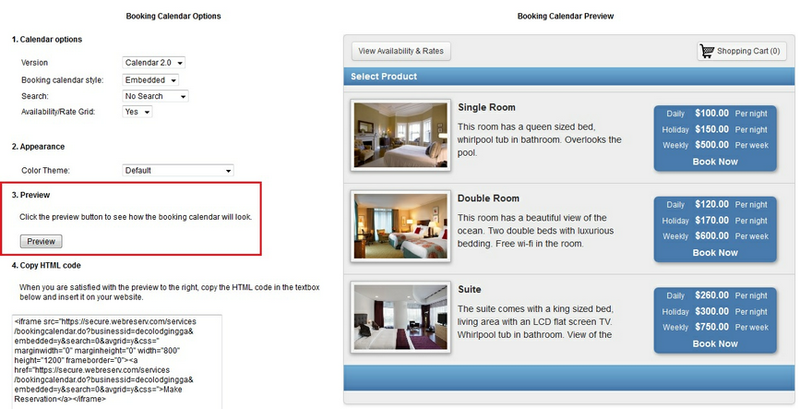 The booking calendar is an HTML code within an iFrame. This technology allows you to embed the booking calendar into your own website to make for a seamless booking process for your customers. You'll find the code in your account by clicking on the Website tab. On this page, you can access the link to your listing on WebReserv.com as well as customize, preview, and access the HTML code needed to add the calendar to your site. You can find the link to your WebReserv.com listing here. Having an account with WebReserv comes with a listing on our website. 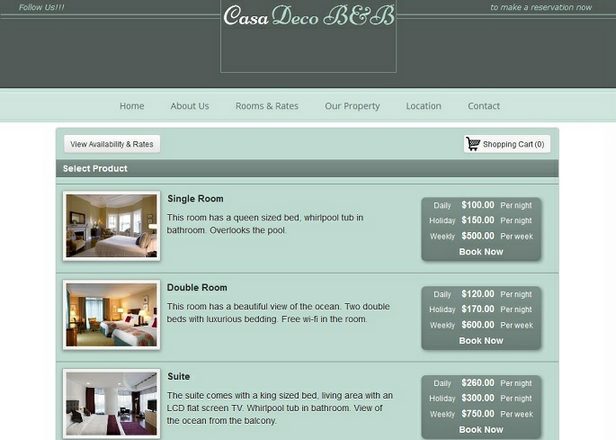 This listing allows customers to find and book with you directly from our site. It's fully integrated into your system, so when you get a booking, you'll enjoy the benefits of real time availability and automatic notifications. Version - Choose from our 2 versions of the booking calendar. Note that Version 2.0 is our most updated version, and the recommended one. Availability Grid - Select yes to have an Availability Grid option. This will create a button at the top of the booking calendar where a customer can get an At-a-glance view of your inventories availabilities. This is ideal for Rentals and Campgrounds. Appearance - Choose from the many options for color themes or create your own using our easy to use color grid. An example of what the Product Listing view is shown below. This option, if set to yes, will allow customers to see a view of all your inventory and rates for a week at a time. On the first page of the booking calendar, your customers can click on "View Availability and Rates" button to see the grid view. Customers can also choose a date and see availability for that week. When you are done customizing the booking calendar, copy the HTML code from the section 4 - Copy HTML code, and paste the HTML code into your website editor at the place where you want the calendar.